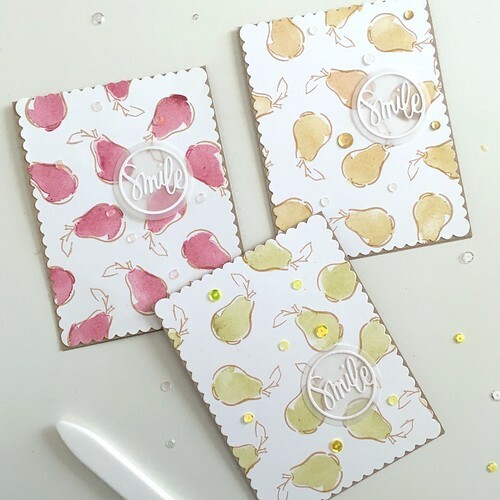 Three happy cards seem like a good recovery from last week’s sympathy card post, don’t you think? 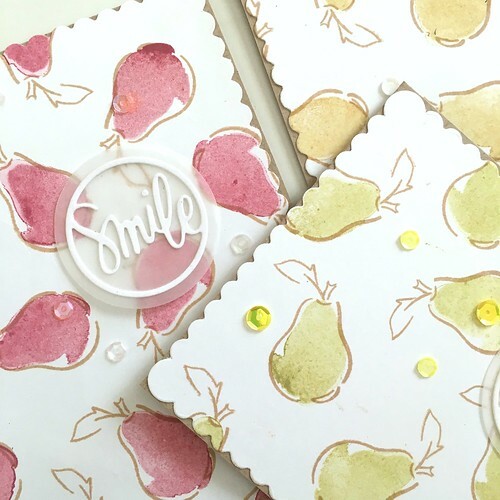 I have been making lots of card sets lately (see here, and here…and here) and this Punny Produce: Pear set from Wplus9 was so cute and simple I couldn’t stop with just one card, so I made three! 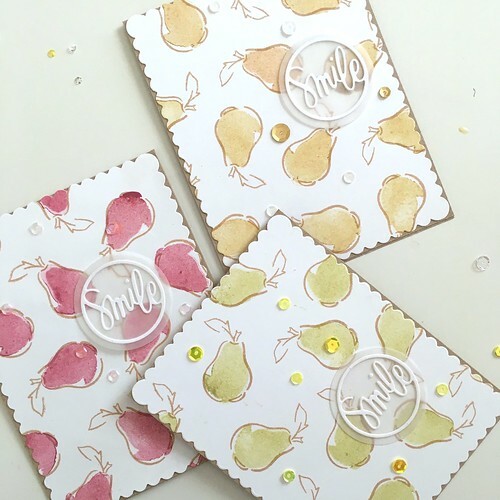 I started by stamping the pear outline in a medium-tone brown ink onto three different scallop-edge card panels. Next, I chose three colors of ink and stamped the solid image inside each outline. I did something a little different for the stamping this time, though! I used second generation stamping for each solid filler image. 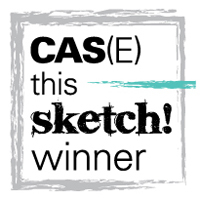 So, I’d stamp off once (using varying amounts of pressure) onto some scrap paper before stamping the image onto my project. This created a nice effect along with some variation of tone on each image, which I really like.The ink colors I used were: Appletini, Old Gold and Cranberry Crush, all of which are dye inks from Wplus9. The stamp set also includes a solid image to fill in the stem and leaf outline, but I decided to skip it for this design. 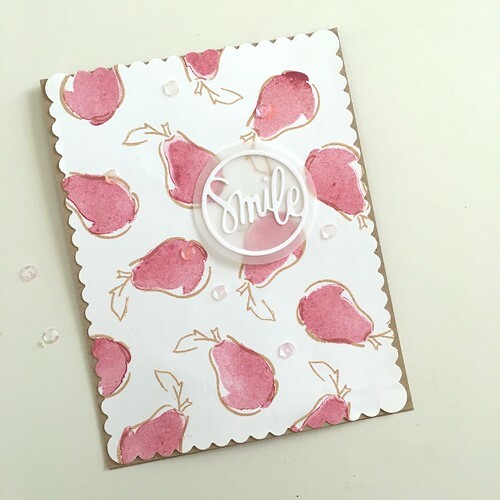 I kept the sentiment fairly simple, using only the Smile Circle wafer die and some vellum (cut into a circle using this die set). I cut the die twice for each card, and sandwiched the circle of vellum between each smile die cut with some Multi Medium Matte glue before adhering it to my panel with the same adhesive. I mounted each panel onto an A2-sized card base made of Neenah Desert Storm card stock and then added a few sequins in coordinating colors to finish each card!